1. Cook pasta according to the package instructions; drain. 2. Mix together the ricotta cheese, parmesan cheese and egg; set aside. 3. In an oven safe skillet or baking dish place 1 cup of pasta sauce onto the bottom and top with pasta. Cook pasta according to the package instructions; drain. Mix together the ricotta cheese, parmesan cheese and egg; set aside. 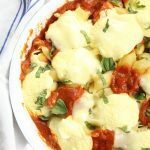 In an oven safe skillet or baking dish place 1 cup of pasta sauce onto the bottom and top with pasta.